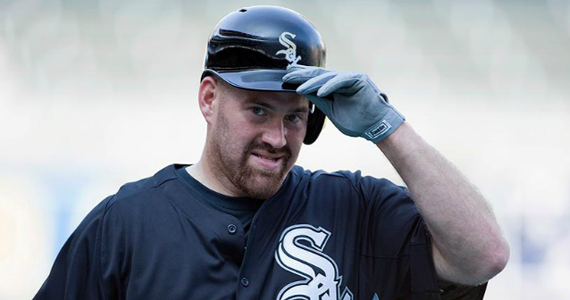 ‘YOUK’ MOVES ON: A ‘TOXIC’ DUMPING OR JUST THE RIGHT TIME? Jerry and Jobu discuss the Kevin Youkilis trade. As sad as it is to see the moving on of a player who always gave it everything he had, played the game with passion, and contributed significantly to his adopted city, it was unquestionably time for Kevin Youkilis to move on. I wrote about this very possibilty last Fall, in my review of the rather forgetable 2011 Red Sox season. I pointed out that, although 2011 had been a respectable year for him, with 17 homeruns and 80 RBI’s, he was often injured and played in just 120 games. This was following a year which saw him in only 1o2 contests. You’ll have to go back to 2009, when he drove in 94 and hit 27 homeruns to find his last All-Star caliber season. (Even then he missed 16 games.) The 6’1″, 220 pound body of his just doesn’t seem to be able to sustain his all out style of play, and at 33 years of age, it’s not likely to get any easier. It’s also ‘toxic’ dump time, as well, I fear. Let’s face it, how many successful, emotionally charged baseball players can you name? Not many. The game is just not condusive to that type of approach. Both the individual games, as well as the season itself are just to0 long and slow, for someone to burn that hot without burning both himself, and those around him, out. It may be inspirational to a point if you’re successful and the team is winning, but it can get toxic if things are going bad. I have to assume that the clubhouse was finding itself divided between those veterans who felt compelled to support Youkilis, and the newer guys who see Will Middlebrooks as the future. Management has admitted that this was likely Youk’s last year, and that Middlebrooks was expected to be called up in September, and take over at third base next year. The future sometimes has a habit of arriving early. Although I doubt that even a change in scenery is going to totally transform Youkilis, I have to admit I wish they had traded him to the National League. It’s very easy to image a scenario where he’ll comeback to haunt them in the race for the Wild Card. Red Sox karma just has a habit of working that way. Then again, maybe 28 year old Brent Lillibridge will turn out to be the 2012 edition of Dave Roberts, and Zach Stewart (25) will play the roll of Bronson Arroyo. 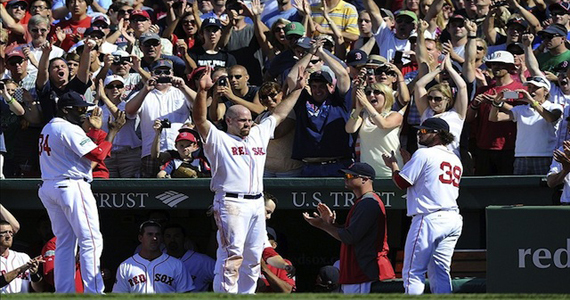 Only time will tell, but one way or another, Kevin Youkilis provided Red Sox Nation with enough wonderful memories (especially from 2007) that he’ll always have a special place in our hearts. Of course, we hope he hates Chicago, but thanks for being in Boston, Kev! I asked Jerry’s permission to give my take on the Youkilis trade from my point of view as a Yankees fan, and he graciously accepted it, because that’s the kind of guy Jerry is (see? I can be nice to Sox fans). Jerry pretty much touched upon every point I would have made about Youk, so I’ll keep this brief. I think they did the right thing in trading the guy. He’s worn down physically and was on his way to becoming a serious “Nomar-like” clubhouse problem (also, how many guys are going to contradict Bobby V. this season?). When a star caliber player begins breaking down and playing less effectively, it never ends well. I did think Bobby V. could have handled things better, but his history is not one of being the best handler of situations, especially with top players on his teams (Todd Hundley, anyone?). Either way, I still think the Sox did the wise thing by treating this issue like a bandaid, and just ripping it off cleanly and quickly. That type of thing could have festered for another month, so why let it? That being said, there was always something I hated about the Yankees facing Kevin Youkilis in big games. I didn’t look up statistics on this, but I feel like he’s one of the guys who really enjoys beating the Yankees and getting big hits against the Yankees. I’m glad that, if the Sox do work their way back up the standings, we won’t have to deal with him at Fenway in a walk-off type of situation late in the season. Now that he’s on the White Sox, the Yankees won’t face him as much, and hopefully he focuses all of his revenge homers on them instead of us.